Does your dog have a microchip? If not, it may be a good idea to get one implanted into your dog. Microchips are implanted by using a needle and feels like a typical injection. The microchips are about the size of a grain of rice. 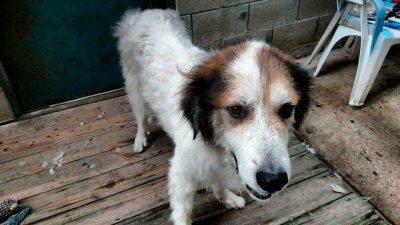 The most recent “lost dog” story had a happy ending when the shelter who found the dog was able to scan his microchip. Apollo, a St. Bernard/Great Pyrenees mix, was found astray in Swansea, Massachusetts. Okay, you may think, it’s not uncommon for dogs to get lost. But, Apollo was originally from Florida! How Apollo traveled over 1,100 miles away from his home is still a mystery. The owner doesn’t believe he could have walked on his own as he is an older dog. The animal control officer in Swansea thankfully thought to scan Apollo for a microchip. A dog’s microchip contains identification numbers. When the microchip is scanned, the identification numbers come up which then can be linked to the microchip registry. The registry contains contact information of the dog owners. Apollo’s owner was contacted down in Florida and she was shocked! She wasn’t shocked at the fact that Apollo was alive, she was shocked by his location. If Apollo didn’t have a microchip he wouldn’t have been reunited with his owner.